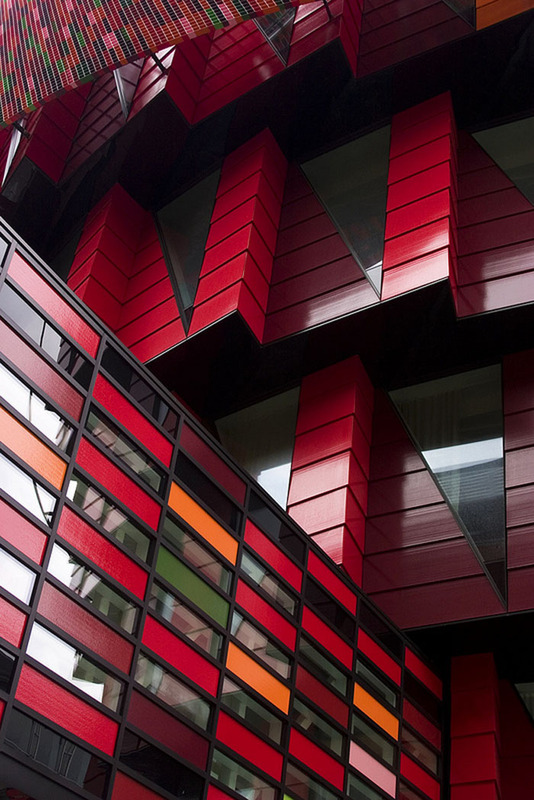 Kuggen (The Cog in Swedish) is a brightly colored sustainable office building, designed by the Swedish firm Wingårdh Arkitektkontor, nestled in among Lindholmen’s other office buildings in Gothenberg, Sweden, in less colorful shades of gray. The newish building acts as a hub for formal as well as informal meetings between the local, and student, community and the business community. The design is not only unique in its aesthetic, but incorporates state-of-the-art solutions for adapted ventilation, lighting, heating and cooling that minimize the environmental impact. Growing by two room units per floor, from bottom to top, creates shading for the windows on the previous floor, as well as a curved screen that rotates around the building—following the sun’s path—providing additional shading. The roof has built-in sun collectors that complete the solar energy system. The cylindrical shape of the structure allows for lots of floor space, and the triangular windows provide both open-plan and private office spaces with good daylight, reducing the need for artificial lighting. I find it interesting that they have chosen to keep the interior palette to neutral tones, but then, I guess working in a bright red office space could be a little distracting and, of course, not as energy-efficient. 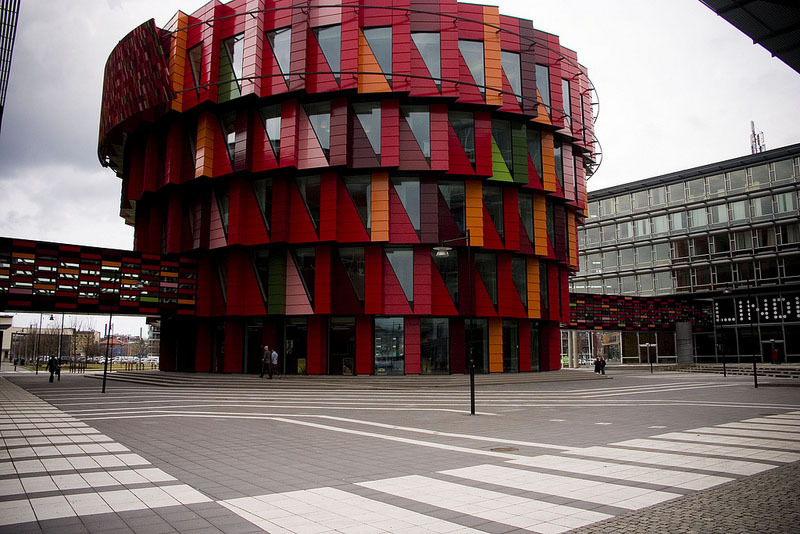 Top two photos from David Anderson’s flickr; Other photos by Ake E:son Lindman courtesy of the architect.